Anybody's Nightmare is a 2001 British television film starring Patricia Routledge and Nicola Redmond. It tells the true story of music teacher Sheila Bowler who was wrongly arrested, tried and convicted for the murder of her husband's 89 year old aunt Florence Jackson in 1993 after she drowned in the river Brede in East Sussex in 1992. 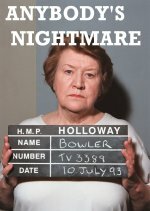 The film chronicles the investigation, trial and the subsequent four years of Sheila's sentence in Holloway and Bullwood Prison before her successful appeal in 1998. From a digital TV broadcast. Copyright Vic's Rare Films 2004 - 2017. All dvds are guaranteed to work in the UK and Europe, Australia and other PAL format regions. Outside these regions, including USA and Canada, we advise you check your equipment. All orders are supplied with full artwork and covered by our 30 day guarantee. We are committed to bringing you the highest quality films available.